This year, Mettagroup’s small band of intrepid meditators (Paola and the Metta Boys) hit the road to experience firsthand the three holiest sites in Myanmar. The Shwedagon Pagoda in Yangon, The Golden Rock on Mount Kyaiktiyo, and the Mahamuni Buddha image in Mandalay. Sann Yu Maung, our awesome Licensed Tour Guide, says that anyone who visits all of them in one fell swoop will have extraordinarily luck. So there you have it, six more people on the planet with extraordinary luck!! On my return to the City of Angeles, my friend Daniel Ahearn reminds me of the Taoist story: “An old farmer who had worked his crops for many years. One day his horse ran away. Upon hearing the news, his neighbors came to visit. ‘Such bad luck,’ they said sympathetically. ‘Good luck, bad luck, who knows,’ the farmer replied.” Perhaps a little Mudita: May Good Fortune Fill All the Days of All of Our Lives…. Mandalay has such a different vibe from Yangon. Smaller, slower, older. We flew south to Inle Lake. The light there after the sun sinks below the mountains is pure lavender. U Indaka Sayadaw said during a Dharma talk he is continually surprised by the expressions of self-hatred that so many foreign yogis express during their interviews with him. He says, “I love myself. How can you not love yourself?” Perhaps the differences in child rearing, the Myanma (Burmese) community or alloparenting parenting model verses our western nuclear families cause one group to experience self-hate and the other self-love. Perhaps the differences in western personal identification verses the eastern group identification contributes. Western striving to be better than everyone else verses the eastern desire to fit in with the group. Sayadaw’s instructions for dealing with the self-hatred/western negative self-talk is to ignore it and focus your attention on Metta Mind. If the distraction of the negative self-talk is impossible to overcome, use a few minutes of vipassana meditation to examine the source of the negative self-talk and then when you see the root causes as empty, return your attention to the cultivation of Metta Mind. In the Myanma-style (Burmese-style) retreat interview, a yogi is meant to limit their report what is happening in the present moment and only the present moment. The teacher will then respond with instructions of where to go from here. What do you do when lobha (extreme greed), dosa (hatred that arises from greed) and/or moha (lack of awareness of your motivations driven by greed) overwhelm poor little ineffectual Metta Mind? What I found helpful on this retreat with endless lobha, lobha, lobha, ceaseless dosa, dosa, dosa and a cavernous lobha for moha was to drop into a short stretch of vipassana, examining the content of the emotional regulating self-talk, and to come up with Metta phrases that were an exact antidote to the agitated mind. During this retreat, fearful mind was frequently triggered by a sense of being unseen. Noble silence can easily trigger the attachment mechanism. The phrase the settled my mind and allowed me easily find Metta Jhana was: People see you, people love you, people support your work. Ignoring lobha, dosa, and moha seemed to ramp up the thinking mind. Providing a direct antidote to the content of thinking quieted the mind. Perhaps another difference between eastern and western? Mettagroup will be going back to Myanmar next February for travel and retreat. 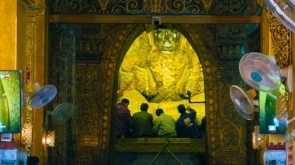 We will be going to the Golden Rock and then Win Sein Taw Ya, the largest reclining Buddha image in the world near Mawlamyine south of Yangon. Then, a Vipassana retreat!! After the retreat, off we go to the Great Budhhas of Monywa, one standing, one reclining, then onto the 2,200 pagodas of Bagan. Registration will open in May. Join George for a walking meditation captured on retreat in Myanmar! Also, for people out New York way, our Spring Retreat at the Watershed Center, April 13-22, upstate in Millerton, NY is open for registration. This is a Metta-Vipassana retreat, four days of Metta practice followed by four days of Vipassana practice. The Metta practice softens and opens the heart and mind so the Vipassana can go deep. There is no substitute for retreat practice when it comes to going deep. Hope to see you somewhere along the path.